﻿Holiday houses with a tennis court and cottages with tennis on site. 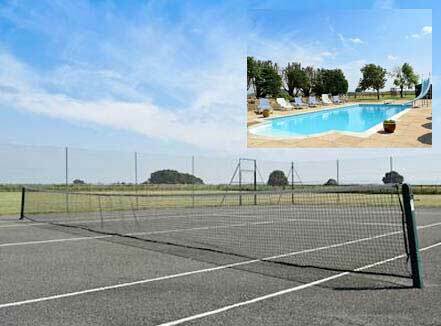 Luxury holiday houses with a tennis court for keen tennis players, or groups of families with children who love to play. Players will have hours of entertainment on court and you can even consider hiring a tennis coach to run off excess energy and focus on the 'perfect serve'.Many properties in UK have their own tennis court, and some have use of a shared tennis court. Some holiday cottages have all-weather tennis courts, tennis is a popular sport - not just in the summer. Many tennis court surfaces will allow for even playing in the drizzle. Tennis is a holiday activity that will suit large groups, families and couples - you can challenge your friends or partner to a serious match, a mini tournament or just a friendly game! Tennis is the perfect on-site activity to keep everyone entertained outdoors, within the grounds of where you are renting - and a great way to let off off steam. Private courts - or tennis court on-site - Hand picked! If you love tennis, you will want to keep your game going on holiday. Many tennis coaches will travel to private courts - so lessons may be an option too. In England, Scotland and Wales, tennis coaches are registered with the LTA. 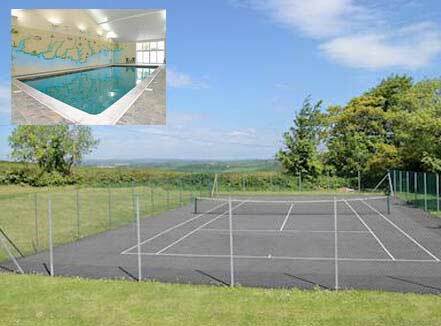 Holiday house sleeps 10 people - outdoor swimming pool tennis court. Large holiday house near Stratford-upon-Avon, Warwickshire, England. All-weather full size tennis court, swimming pool and games room. Outdoor heated swimming pool with diving board and slide. House with tennis court in grounds Harbertonford, near Totnes in Devon. A tennis court in the grounds and shared indoor heated swimming pool. Good tennis players will holiday with their tennis rackets - more relaxed players will be happy to borrow someone else's - so check if racquets, balls and equipment are provided by the holiday house owner, or if you need to take your own. If the tennis court is an on-site tennis facility, shared with other holiday makers - you may be able to arrange a tennis tournament for the end of the week! Remember to ask if you need to book the court for guest times. Houses with private courts will have the luxury of no added competition for on court time. Local tennis clubs and indoor tennis facilities may also be close by. This can be useful for finding coaches and additional competition if required! Often a tennis club will have cardio tennis sessions or various age group lessons that they welcome visitors to join 'ad-hoc' and indeed if they have competitions or tournaments running, players are often welcome to join in. Looking for a tennis holiday or wanting to watch tournaments in UK? WTA Ageon in Nottingham, England 9 June - 17 June 2018 - Caroline Wozniacki, Petra Kvitova and Donna Vekic have confirmed they will play this summer. ATP Ageon The Queen's Club, London, England - 18 June - 24 June 2018 - Rafael Nadal is due to play this year. All England Lawn Tennis Wimbledon, London, England - 02 July - 15 July 2018	If you are on holiday and unable to visit - you can see live results from wimbledon online but if you are close to London or south of England - try anad visit, it is well worth it. Big house for a holiday in North Yorkshire near Scarborough with 6 bedroom, sleeps 12, Pets friendly, Barbecue, Golf nearby, Pub within 1 mile, Wifi, Cot Available, Coastal Property. Big house to rent in Powys near Llandrindod Wells with 5 bedroom, sleeps 14, Pets friendly, Golf nearby, Wifi, Cot Available. Big house in Dorset near Bridport with 9 bedroom, sleeps 18, Pets friendly, Barbecue, Ground Floor Facilities, Pub within 1 mile, Wifi, Cot Available, All En-suite. Large holiday house to rent in Norfolk near Brundall with 6 bedroom, sleeps 12, Pets friendly, Barbecue, Ground Floor Facilities, Pub within 1 mile, Wifi, Cot Available, Swimming Pool.